I got this for my grandpa for Christmas to take when he goes hunting up north. It works great! Sound is very good, the bass booster is cool but nothing special in my opinion. My favorite part though is the AM/FM reception it gets. It comes with a very long, extendable antenna. Overall, I'm very satisfied! For those of us who have a variety of recorded music, this equipment is perfect. It is lightweight and travels easily... it is simple to use...and provides good sound. This boombox is a nice little compact unit with remarkably good sound. I haven't yet tried out the CD or cassette player. I'm using it to play an FM classical station for background music. I appreciate the "old school" reliable connection that we don't always have with our internet. Excellent sound quality,easy to use compact and light weight. This product was brand new as promised. It's portable and runs on batteries as well as AC. 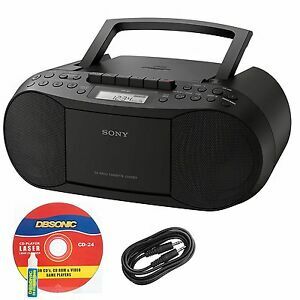 We bought this to listen to audio books on CD. It's portable so we can move it from room to room while we're listening.